Pakistan 5-190 (Ahmed Shehzad 111*, Shoaib Malik 26, Abdur Razzak 2-20) beat Bangladesh 7-140 (Shakib Al Hasan 38, Nasir Hossain 23, Umar Gul 3-30, Saeed Ajmal 2-20) by 50 runs. Pakistan hammered 190 for the loss of five wickets in 20 overs and Bangladesh managed 140 with three wickets remaining. Ahmed Shehzad (Pakistan) was declared ‘Player of the match’ for his unbeaten powerful innings of 111from 62 mere balls. The ICC World T20 – 27th Match, Group 2, was played on Sunday, March 30, 2014, at Shere Bangla National Stadium, Mirpur. Earlier, Mohammad Hafeez, the skipper of Pakistan, won the toss and decided to bat first on a good looking surface. Ahmed Shehzad initiated the innings in style while the wickets kept on sliding at the other end. He completed his fifty on the 30th ball and the visitors lost their 3rd wickets at 71 when Shoaib Malik took guards in the center. The duo kept on striking the ball nicely and enhanced the score to 154 as Shoaib Malik was gone for 26 and replaced by Shahid Afridi. Ahmed Shehzad thrashed his maiden T20 century on the 58th ball and became the first Pakistani to reach three figures in T20. He remained unbeaten for 111 off just 62 comprising 5 towering sixes and 10 fours. Shahid Afridi was gone for 22 while the Green Shirts amassed 5-190 after 20 overs. Abdur Razzak was the main wicket taker with two whereas Al-Amin Hossain, Shakib Al Hasan and Mahmudullah held one wicket each. The Bengal tigers had an awkward beginning by losing their four top order batsmen at 47 in 9.1 overs. Shakib Al Hasan along with Nasir Hossain tried to consolidate the innings with some quick runs. The first was dropped by Shoaib Malik at 36 but was caught by Umar Akmal off Umar Gul for 38. 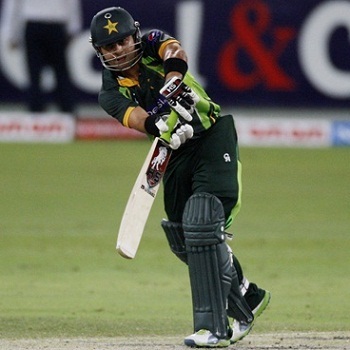 The fifth wicket fell at 91 and Nasir Hossain was stumped smartly by Kamran Akmal off Saeed Ajmal for 23. The target became too difficult for the home side and they reached 7-140 in 20 overs. Umar Gul was the star performer with three wickets, Saeed Ajmal got two whereas Zulfiqar Babar and Shahid Afridi shared one wicket each. Pakistan clinched their important encounter with a big margin of 50 runs and took their points tally to four. Confine India around 265 and win – Nasir Hossain predicts for Bangladesh, Asia Cup 2012.